WABI”’ winter projects. – Dirty wet dog , boats and sailing. I was talking about finding a heater for my Hunter Liberty recently and then had to set that project aside when i used that money for a different and more important long term project (self steering). I had just about got to the point where i had decided which heater i was going to fit but then dropped the project mainly due to cost. Then one of my readers asked me a question about heaters and i thought it best to respond by starting a post about what i had worked out so far so what i thought i would do is a general post about the jobs i am going to do this winter. 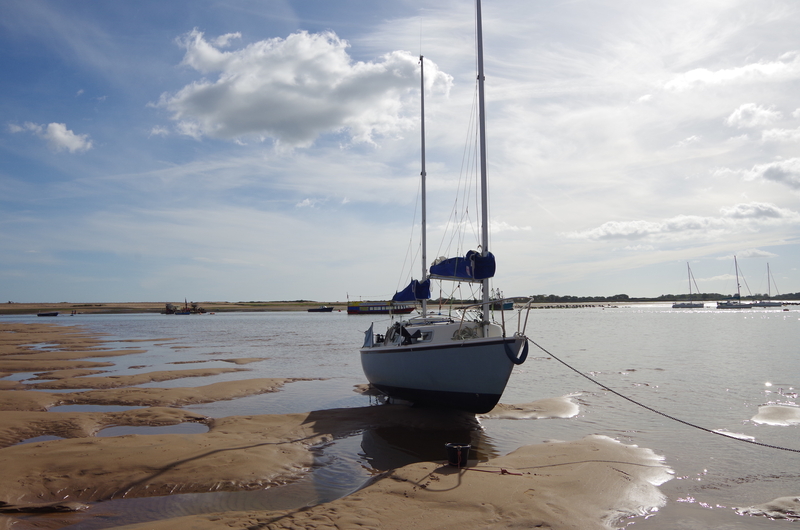 Yesterday we made a quick day-trip to go and check out WABI”’ in her mud berth, catch up with boss-man Mark and show Jax around Topsham a bit. WABI”’ is still nice and snug in her inside berth and Mark is going to move her onto a more accessible berth for me this week. All i really had to do this week is give her a quick air through with the hatches open while we went off for a walk. I did take the new tillerpilot with me and the measurements for where the deck socket and tiller pin needed to go but i found that the work had already been done by a previous owner : all i need to do is fit and wire the new power socket, about half a days work. So : my winter jobs are. 1.Quick haul-out , power wash, wet-sand and apply one coat of antifoul as and when Mark has a spot to lift me out and put me on the hardstanding for a couple of tides. 2.Fit the tillerpilot and wire up the new socket. 3. Start the cabin roof project which is to organise and lead-aft all the reef lines and control lines such that everything is in a logical space. I think i will fit a different halyard winch and new jammers as both of us dislike the gibb self-tailer that came off the centreboard line. What i really want to do is have all the lines on the small section of coachroof next to the main hatch but not encroach on the cabin bulkhead and leave an area free for project 4 which is the cabin heater job. 4.Fit a permanent cabin heater. My plan is to research, find and fit a small heater inside the boat and the one place that i think i can use is the forward (cabin) face of the heads bulkhead where on many boats the galley is placed : note that i took that off soon after i bought the boat and now use my galley as below. I don’t have a picture of this part of the boat in total but liberty owners will know where i mean (in a while i will go acquire one from the net)….the obvious problem is that i have gone and put my electrical panel exactly where the flue needs to go vertically up to the coachroof . A. Dickinson ‘Newport’ solid fuel stove as seen here . The plan would be to mount this as low as possible on that bulkhead and as near the centreline of the boat as possible to keep it away from the port berth. It does need a 3″ flue which needs to be as vertical as possible but which might need a couple of angles to get it to the right place through the coachroof. Cost of the stove would be around £450 + another couple of hundred for the flue, angles and deck flange/cowl. The advantage is that i produce a lot of small dry firewood and can carry some of that easily on the boat and it doesn’t need a fuel tank of any kind. This is a small propane fuelled heater , slightly smaller than the Dickinson solid fuel heater but also now made by the same company. I haven’t so far been able to track one of these down in the Uk but the US price seems to be around $460, obviously on top of that i would have to pay postage which would be around $75 and then pay our rapacious tax system for the pleasure of importing one. After that it would still need a flue but only 1″ pipe which coule be bent around a bit to fit but would also need a professional gas installation and a small propane tank probably mounted in the back of the cockpit. Anyway here is the question that prompted the post. I was considering a charcoal burning Turkish samovar for heating my Liberty. Portable, compact, nice dry heat and a snip at only £35. Stand it opposite the heads and use a length of pipe as an exhaust out of the companionway. I must admit that i have never come across a charcoal fuelled samovar so that’s completely new to me and so far haven’t found one even to take a look at so i will bounce that one as a general question to anyone who wants to take a punt. Diesel fuelled stoves : we had a refleks stove on the big yellow boat and that worked well, they are common on scandinavian fishing boats. Solid fuel stoves : i had a charcoal and peat stove on the frances. Pressurised parafin….spent some time aboard a boat with one and it seemed ok.
A quick run-down on these. 1.Pressurised parafin. The only one i know of on the market now is the one made by Taylors in the UK and marketed by Blakes/Lavac http://blakes-lavac-taylors.co.uk/taylors_079k.htm . The heater has a burner/chamber which needs a flue to the outside and a separate pressurised fuel tank. The current cost of the complete new stove last time i saw a price quoted was well over £1000. (around 1700 euro complete : http://www.toplicht.de/en/shop/ofen-herd-und-kocher/petroleum-heizung/taylors-79k/taylors-petroleumheizung-079k) I have heard very mixed views about these with the trend being that they need a lot of maintenance and care from their owners. The advantage i see is that they can be easily bulkhead mounted, don’t need much space and the fuel is cheap. I think i could fit one if i really wanted one but would never spend that much on a rarely used bit of equipment. 2.Solid fuel. I had a solid fuel stove which came with the Frances 26 and ran on a mixture of peat blocks, wood, coal and charcoal. Although very effective it was i think a very dangerous stove as it tended to vent gas from its top openning sometimes and i stopped using it when i am pretty sure it flooded the cabin with carbon monoxide one night. I do like solid fuel stoves because they are ultimately very simple and i for one can scavenge firewood easily although storing a significant amount on a small boat is a problem. There are some small but tall ones around that could be bulkhead mounted and some very ‘cutsesy’ ones around in the US. This i think is the miniature one aboard Sjogin. From memory i think a Cowes chandler (Pascall Atkey) used to sell a small ‘tall’ charcoal stove especially for boats although i can’t find any reference to these on the net. Small propane heaters : as above, the only small one i can find is the Dickinson ‘Cozy Cabin’ heater from the USA. Seen them on lots of modern cruising boats. I wouldn’t have one on WABI”’ as i don’t have diesel so it would need another tank and a third fuel (remember i already have petrol and meths) All accounts say that these systems are very power hungry as well and i am already adding load this year with the tillerpilot. Edit. I was just asking the chandler that stocks the Dickinson stoves in the Uk about the solid fuel stove and the propane stove. It seems that the propane one can’t be sold in the Uk because it doesn’t have a CE mark. I don’t know whether that also means that a professional gas fitter would refuse to fit one and give it a gas safety certificate for the boat. Next Chickens, eggs and ultimately omelettes. We had the Canadian force 10, aka cosy heater, but pressure kero, for underway and a Little Cod for at anchor. That got switched out for a dickerson, way easier, faster and less room. Had the cheapo lookalike Cole stove, ditto performance. Great stove at half the price and moved to our Oughtred wee seal mk2 at 19′. My wife loves heaters and the zen like pleasure of working and watching the fire. Even have a giant brass chafing? Burner from an italian rest, just a big Origo on the V20.